suitable for use with 8 mm Pitot. 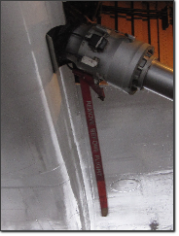 A Pitot cover is a simple device that have the finality of protect the pitot unit at rest or during the storage, pitot main enemies are dust moisture and mechanical tip damage. Entrapped moisture and condensate can lead to wrong measurements and to premature sensor failure. A good cover must ensure that rain, dust and insects cannot enter the pressure lines nor yet allow the insects to go live inside the unit. The pitot cover must also be highly visible because if it is not removed the airspeed indicator will not work once in flight. 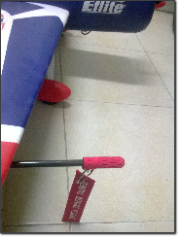 Visibility is assured by the so called “remove before flight” ribbon. This ribbon is becoming a quite common gadget for RC electronic devices. Effectiveness is warranted by a strict pre-flight checklist, indeed for RC planes it’s sufficient to count the ribbons that have been collected before the flight, if they are the number expected then is safe to proceed. here are many pitot cover producers, pitot tip dimensions are quite standardized so it is easy to find a pitot cover for full size airplanes neither cost is a problem. Commonly used pitots have a separated static port located on the fuselage, so only the pitot total pressure port should be protected by the pitot cover, on the static port there is a pin. There are three main available cover typologies. The first is a hinged pitot protector that opens automatically during take off, the mechanism is composed by a target aerodynamic surface linked to a spring as per figure AP.2. Figure 3: Cap and ribbon type cover. The higher complexity of this device is justified by the fact that closing is not operator dependent. Second type is composed by a rigid cap that fits on the tube and a before flight ribbon. Figure 4: Fabric type cover. Third type is composed by a cloth that is slided over the tube. First type of cover have been excluded because in our pitot static ports are integrated on the tube and this kind of arrangement impact too much on the aerodynamic behavior. The fabric type cover require sewing skills, instead 3D print construction is chosen. Is easy to conceive a cap that cover static and total port, have a look to the figure AP.5 for the first virtual prototype. After modifying some shapes I reached to the solution in Figure AP.6. I chosen that solution because the print cost is lower due to lower overall weight.